One man who made a small fortune for himself was native Calvertonian, Jonathan Labray. His strange surname a corruption of 'Labourer'. His family were certainly known among the freeholders of the village in 1692. He was fortunate when he inherited a small property. As of which he invested in the business he knew most about, that being the stocking trade. He bought frames which he subsequently hired out to other knitters. From the cash earnt from these he started his own hosiery firm around St Peters Church Yard in Nottingham. 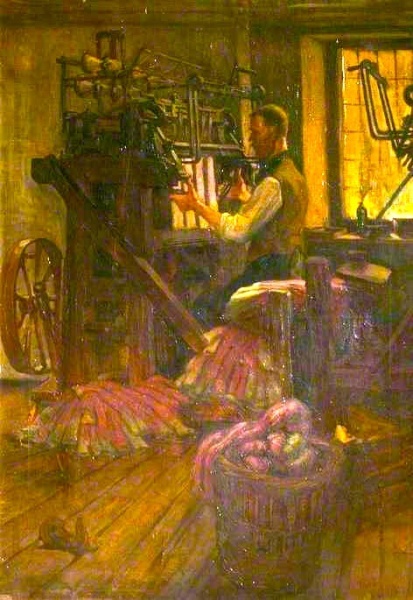 This business was set up to "buy, make and sell worsted frame wrought hose and yarn and frame wrought thread and cotton hose." The joint stock of the company was £1800 (£180,000 nowadays). He had taken on workers all around the county. These people, working from their own homes, hired their knitting frames from Labray for £50 a year. The business boomed, he purchased land, mainly within Calverton village which he soon leased out to local famers and the like. Now here he was in the early 18th Century enjoying a profitable trade as a stocking-frame operative in Nottingham and no doubt meeting orders from other parts of the country too. Later events are to lead us away from the belief that it was all work and no play for Labray, although there is no trace of his marrying. He was a man who was quite aware of his origins and his debt to the trade which had brought him a respectable living and a place in the community (he was a churchwarden at St. Peters). His income came from the services which he rendered to the fashionable gentry, but he never lost sight of the hardships facing those who were less well off. ​In 1774, one authority claims, a stocking-maker working four days a week was able to earn half a guinea. That works out to around £27 per year which made Labray one of the better-paid artisans of his day. A man could not work forever. The time would come when his eyesight failed or he became crippled with arthritis and was unable to use his nimble fingers in the way he had done in his prime. There was a compelling urgency to have some money put away for when such a time came, for without it a man was reduced to being a pauper. The lucky ones were those who managed to keep a proportion of their earnings in the security of some local bank. Indeed, banking was a comparative newcomer to English economics at that time. Labray would have been approaching middle-age when the Bank of England was founded in 1695. For the less fortunate, it was as much as they could do to live for the moment and take a chance on what the future might bring. While others preferred to ignore the poverty, Jonathan Labray was numbered among the compassionate men who accepted responsibility for his brothers in society. He was a man of his age. A cynic might regard the countless charitable works of the period as no more than a staircase to Heaven. Labray would undoubtably have been able to look on a boyhood at his old home in Calverton, with news of the Civil War filtering through to add some excitement to the slow country life. Had not King Charles raised his standard in Nottingham to precipitate the war? And what of Newark, under siege from the Roundheads until Prince Rupert's cavalry drove them off? The hostilities which had sprung from local origins were to end nearby also, when the King rode over to surrender to the Scots at Southwell, six miles to the east of young Labray's village. But those times were no more than childhood memories. There had followed the austere period of the Commonwealth and the long hot summer of the Plague. Religious strife had divided the nation again but appeared to have subsided during the twelve years of Queen Anne's reign. Now Her Majesty was gone and everyone was trying to get used to her successor, the Elector of Hanover, recently crowned King of England and Scotland as George I. A foreigner! Whatever were things coming to? There was open talk of revolution by those who favoured a return of the Old Pretender, but that had been killed stone dead by a brief flurry at Preston. 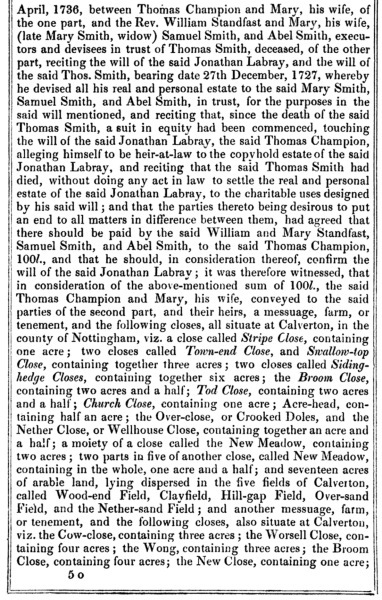 Jonathan Labray saw fit to draw up a will to dispose of his wealth in the event of his death. He had no wife to provide for. His money would therefore go where it would do most good, to people who came from a similar background to himself but who perhaps had not enjoyed the same good fortune. Even in his lifetime he had been a benefactor of the Blue Coat School in Nottingham. He placed great faith in his banker, Thomas Smith, appointing him as his sole executor. When Labray died in 1718, there was a lot to be done by this dedicated trustee. 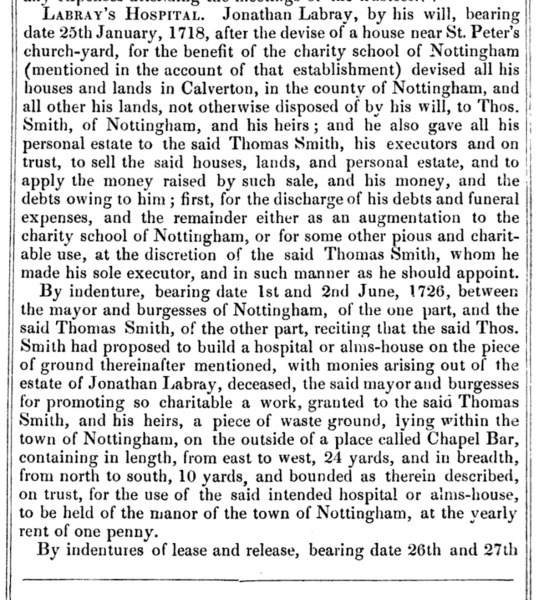 It is worth noting here that the Smith family enjoyed a very high reputation in Nottingham. When he was but a young man, Thomas Smith senior founded Smith's Bank, the first of its kind in this country, which was to operate under various names over the centuries before being integrated within the National Westminster Bank as we know today. Labray's initial trustee, Thomas Smith, was to die in the prime of his life at the age of 45, no doubt fully meriting the epitaph inscribed on his monument, being taken from 1 Corinthians, 4.2: "Moreover it is required in stewards that a man be faithful." Labray had owned land and property around Calverton which brought in a healthy income, quite apart from the business profits salted away in the bank. At Thomas Smith's discretion, ten pounds per year was to be set aside from the estate for charitable purposes in the village of Calverton. 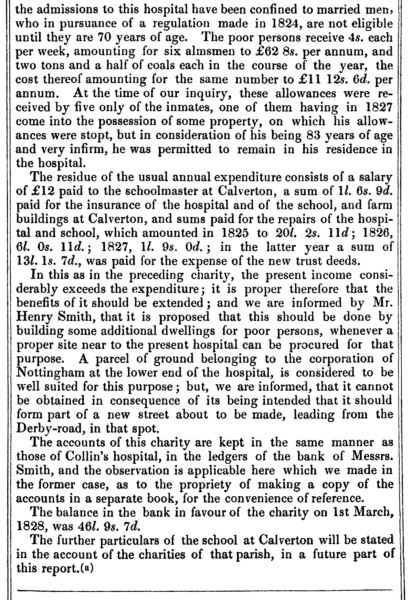 Echoing the benefactor's wishes to perfection, Smith decided to use this sum to support a schoolmaster in order that he might teach poor children free of charge. 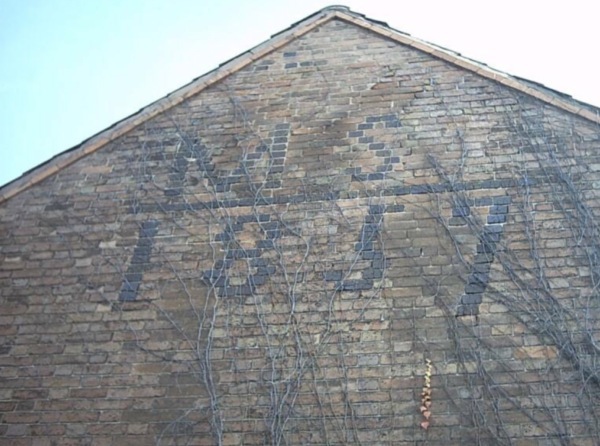 Inscription on the side of 221 Main Street MS 1857 - Matthew Shepherd retired from the office of school master in 1862, when the Trustees presented him with a gratuity of £10, "for his steady and persevering industry" during forty-one years. The stage was set to begin all manner of public spirited deeds, until it became evident that Labray's bachelor status was no measure of his celibacy. 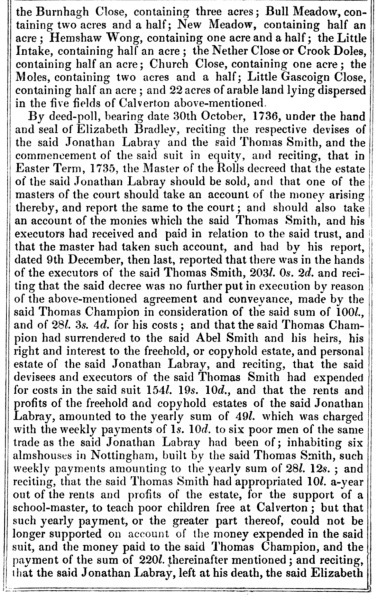 Labray's executors were sued by Thomas and Mary Champion, the former claiming to be heir to the estate. For Thomas Smith, so anxious to do the correct thing, there must have been great consternation. A costly legal wrangle did nothing to resolve the case, although the Champions had a very strong case, even at a time when scientific tests of paternity were necessarily limited. The two parties reached a settlement, by which the claiment received a hundred pounds from the Trust in return for confirming Labray's will. In addition to this settlement, Smith had to meet Champion's legal costs of £28. 3s. 10d., which was a massive blow. 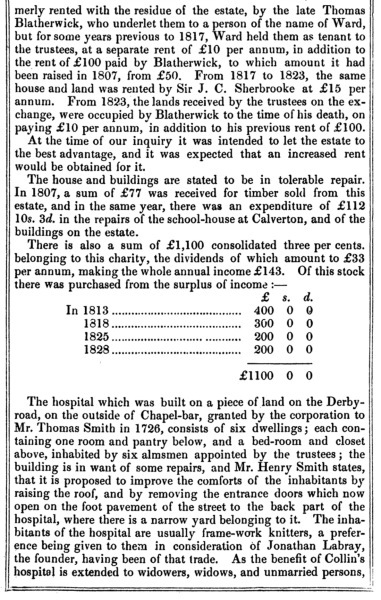 Around the time, this annual income from Jonathan Labray's estate was down to £49, out of which Smith was committed to payments of 1s. 10d. to each of the six almsmen and £10 to the Calverton schoolmaster. The banker must have felt that every cupboard held more than its fair share of skeletons . . . each with a marked resemblance to Jonathan Labray! Now a natural daughter was discovered, for whom no provision had been made in the will. 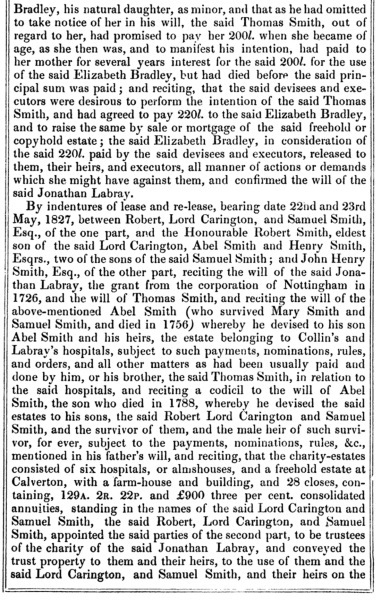 Spurred either by conscience or his earlier experiences at law, Thomas Smith allocated £200 (20,000 today) plus the interest, set aside until Elizabeth Bradley came of age. No one will ever know how much the heavy burden of responsibility accelerated Thomas Smith's own demise, but when he himself died in early 1927 the Labray Trust had been badly run down. 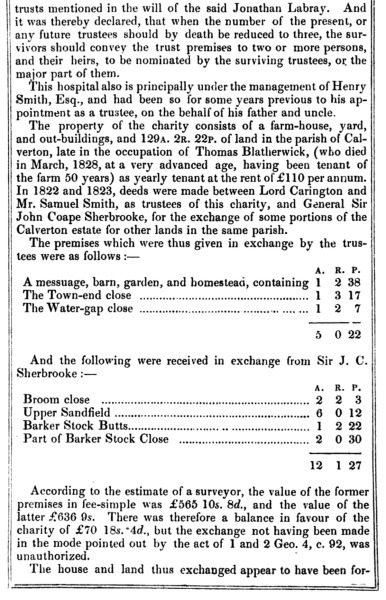 Annual payments to the schoolmaster were slashed to £6, making him heavily dependent on the income he was able to earn by educating other local boys at a penny or twopence a week. The school was run on a shoestring budget. For Labray's Endowed School, these were the lean years and it took the rest of the century for it to fully recover. The Jonathan Labray Almshouses Charity still exists today, providing buildings open spaces and general accomodation to the public and pensioners in Nottinghamshire. Almshouses on Main Street, Calverton. Almshouses on Collyer Road, Calverton. Further reading, Jonathan Labray in the History and Antiquities of Nottingham (1840) By James Orange.